Not The Barnet Times: 100 - Not Out! This is my 100th blog and I hope, dear readers, you will allow me this brief self indulgent retrospective. I started blogging in July 2008 in response to the Barnet Times cancelling Rog T’s blog. I won’t bore you with the details again - the full story can be found here in the archives. Originally, the blog was called “Not The Barnet Times” which was intended as a tongue in cheek response to Rog’s predicament, but it soon became clear that there was a pressing need to report important local political stories which were not being carried by the two main newspaper groups serving the Borough. Not The Barnet Times, was duly transformed into Barnet Council Watch. Over the last 8 months, I have published several scoops. It was this blog which broke the story about the Leader of the Council using taxpayers money to fly business class to America. This blog was the first to reveal that the council spent £14,000 of your money buying wide screen TVs for five chief officers. You read it here first about the offensive video posted by the council on YouTube. I reported on the £2,000 lunch expenses claimed by two chief officers in just one year and that one of those officers also spent another £2,000 travelling to the South of France on a junket. Then there was the shameful story about Brian Coleman increasing the burial charges for children under 3. Most recently, Barnet Council Watch was first to report the news that there are shortly to be two by-elections in the Borough. In addition to these scoops I have, along with fellow bloggers Rog T and Statler & Waldorf, reported in depth about councillors’ allowances, the Icelandic banking scandal and the proposal to scrap the warden service. All of these topics are important to local residents, much as the council would prefer them swept under the carpet. My critics responded to the blog by using false names to post derogatory comments about my mother. A few impressionable Conservative councillors were instructed not to speak to me and, shamefully, those who were more interested in keeping their allowances or climbing the greasy pole, complied. But it has had no affect on my blog. If anything, it has only served to confirm that my articles have been hitting home and that there is a continuing need to scrutinise and report the actions of the council. I am extremely grateful for all the messages of support I have received since starting this blog, not just from my growing army of readers, but from the many loyal party members who understand my motivation for writing and share my frustration with those characters who seek to undermine the concept of democratic accountability which is under threat in Barnet. Congratulations. Crack open a bottle on me. 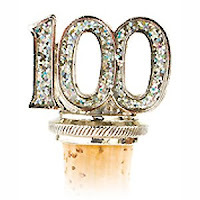 Here's to the next 100 blogs. I now follow the blogs with much more interest than that with which I follow the local papers. Not least because my polite and factually correct comments are not removed continually. MOre power to your elbow sir! Thank you! On this blog, posts will only be removed if they insult members of my family, use obscene language or are libellous (or appear to be so). If readers wish to express forthright opinions about our elected representatives, they are free to do so. It’s called fair comment.